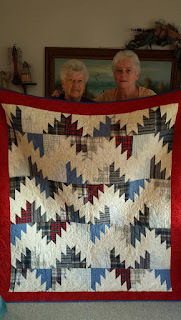 Photo of a quilt that was given to my best friend, Helen. Helen lost her husband a year ago, I got all his shirts and cut them up to make the quilt. Sandi got me started and did the binding. Kerry Marksbury did the machine quilting. I really like how the quilt turned out. Needless to say, Helen needed tissues when I presented it to her.